This hat truly is the Elizabeth Zimmermann baby surprise jacket of hats. Designed in Latvia in 1956, I think it’s destined to become a worldwide favourite over 55 years later. I’ve translated the original pattern (allowed under Soviet copyright law of the period of publication), fixed the errors, added some missing information and an adult size and rewritten it in a form that most of today’s knitters will be more comfortable with. 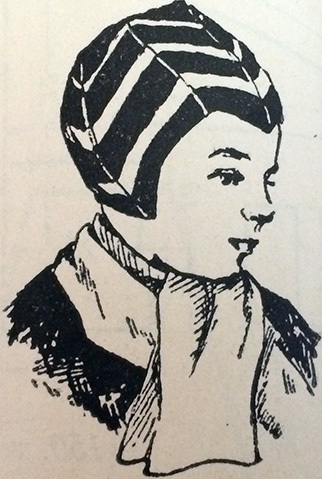 As written the pattern will fit 19-20″ head circumference. To size the pattern up for adults, cast on 156sts and work 27 and 15sts between the increases and decreases instead of 25 and 13. Knit for 7 inches before casting off. This hat is knit back and forth in garter stitch. Work in stripes according to your own choice. Cast on 144 stitches. Use a long tail cast on and begin with the next row of instructions or use a cable cast on and knit one row. (If you used a long tail cast on you won’t need to knit one row before continuing). The next row will be your first right side row. Repeat these two rows until you have worked 6 ¼” from the cast on edge, measuring up from the point at the centre of the row. Cast off, working the increases and decreases in the cast off row. You’ll have a piece of knitting shaped like this, which looks nothing like a hat whatsoever. Don’t worry, it will! Sew the seams, matching A to A, B to B and so on. Block using an appropriate method for your choice of yarn. You now have a cute little hat with a widow’s peak at the front and two large triangular earflaps! It is possible to knit this hat in the round. Simply join for circular knitting after casting on and purl every second round instead of knitting. You can also avoid having to seam the top by joining it using a three needle bind off. Translation from the original Latvian, corrections, additional sizes and information copyright Sarah Bradberry, April 28th 2014. All rights reserved.